For a new spin in remote control fun, it's the Spin n' Go Police Truck. Watch it drive across the floor with the control of a unique and easy to use remote control wand. 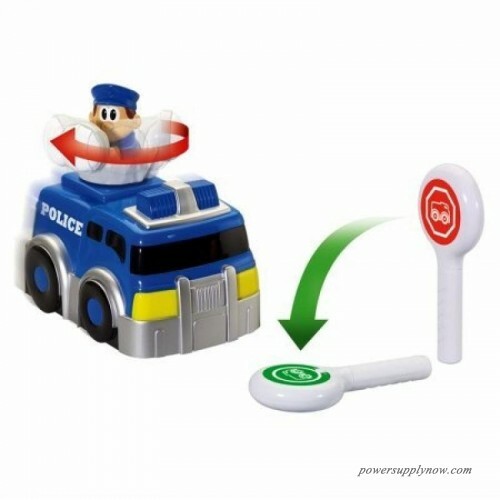 Pull the wand up vertically, and the vehicle stops while the spinning driver whirls and turns in place. Move the wand back down horizontally, and make your truck turn and drive forward in the direction that the driver is facing. It's a whirl of a good time! Recommended for ages 3 years and older. My First RC Spin 'N Go Police Truck is a radio-controlled truck and controller that puts a fun, new \"spin\" on RC fun. This fire truck is operated with an easy-to-use remote control wand, which allows the fire truck to drive forward, whirl in place and much more.